MANILA, Philippines — The memories of the victims of disappearances which are being remembered on All Souls’ Day are being “mocked and dishonored” by Senator Ferdinand “Bongbong” Marcos Jr., the groups Families of Victims of Involuntary Disappearance (FIND) and Asian Federation Against Involuntary Disappearances (AFAD) said. “Today, these poignant memories are mocked and dishonored by Bongbong who insists that the best administration was that of his father as he glosses over the existence of some 100,000 victims of human rights violations during the Marcos regime,” they said in a statement. FIND has documented 882 victims of enforced disappearance, and the number of undocumented cases is believed to be much higher. “Survivors of enforced disappearance under martial law and the families of the disappeared are living witnesses to the rampant human rights violations during the dark years of the Marcos dictatorship. 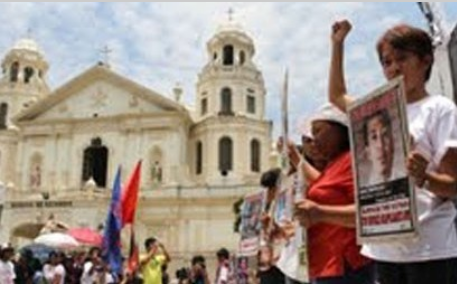 They can tell Bongbong Marcos to his face their harrowing experiences of repression and injustice,” the groups said. At the same time, they urged the Aquino administration to initiate the “long overdue serious investigations” into the unresolved cases of disappearances to bring the perpetrators to justice. Without tombs or columbaria to visit, the families of the disappeared belonging to FIND gather every year on All Souls’ Day at the Bantayog ng mga Desaparecido at Baclaran Church grounds to pray, offer flowers, light candles, and share memories of their missing loved ones. Many of the victims were victims during the Martial Law regime ruled by the late dictator Ferdinand Marcos, the senator’s father. Senator Marcos is running for vice president in the May 2016 elections. “Bongbong Marcos may not have directly perpetrated human rights violations, but he has no right to deny that these inhumane and cruel transgressions were committed during his father’s regime or to concede there were victims but at the same time dismiss them as unintended collateral damage,” FIND and AFAD said. They said the senator “brazenly adds insult to injury” by disregarding the fact that it was his father’s administration that launched the infamous floating rate in 1970, which they said was a de facto devaluation of the peso that persists to this day. “It’s a shame for Senator Marcos who now aspires to be Vice President to flaunt his perfidious ignorance of Philippine history and the country’s political economy,” they said. “Instead of trying hard to clear his father’s name, the noble thing for him to do is to apologize on his behalf, and help the victims and their families attain justice by supporting measures on accountability, truth recovery, reparations, and institutional reforms,” they added.